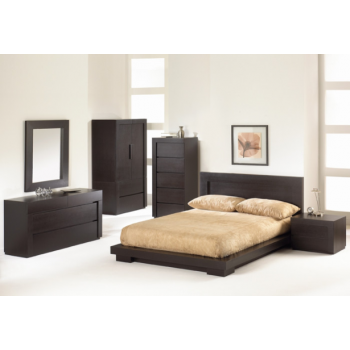 The Toscana contemporary bedroom suite is made of birch. Inspired from the Italian style, the long drawers are painted inside and out and are equipped with self-closing Quadro system glides. The platform bed only requires a mattress that sits on a European-style metal base with wood slats. We offer another version of this bed called the Kangaroo bed. This version allows more storage space for your blankets, pillows, clothes, etc. Available in a variety of finishes according to our color samples. This collection is presented in our chocolate #69 finish.